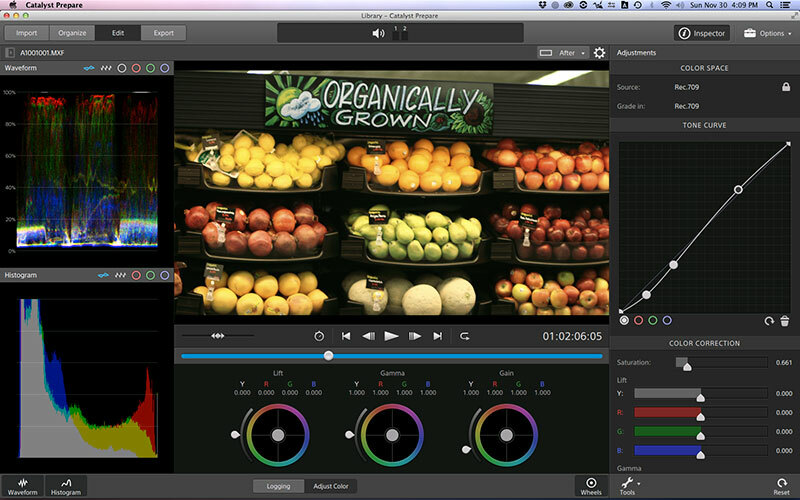 After NAB last year, Autodesk released Smoke 2015 – their Mac-based editing application. This version also marked Autodesk’s shift from perpetual licenses to a subscription model for Smoke. Any new Smoke users must subscribe for an active license, with monthly, quarterly, and annual plans available. In order to attract new users, Autodesk also introduced a free student license, which is active for three years. This is part of a companywide initiative to make all Autodesk software available to students worldwide. I wrote an in-depth review of Smoke 2013 two years ago. This was the first major optimization (after the introduction of Smoke 2011 for the Mac) to convert Smoke from the look and feel of its Irix and Linux roots into a predominantly Mac-oriented application. Much of Smoke 2015’s interface and operational style remains unchanged from that previous version. In the intervening two years, Autodesk has decided that Smoke and Flame no longer need to remain 100% compatible or locked into the same development cycle. Each product has evolved from a core toolset, but more and more is being designed for a specific audience and user need. Smoke 2015 is targeted at editors who want a strong compositor, but are most comfortable with track-based NLEs that run on Macs. This new release is even more Mac-friendly with improved performance on Mac hardware, including the new Mac Pros, iMacs and Retina MacBook Pros. 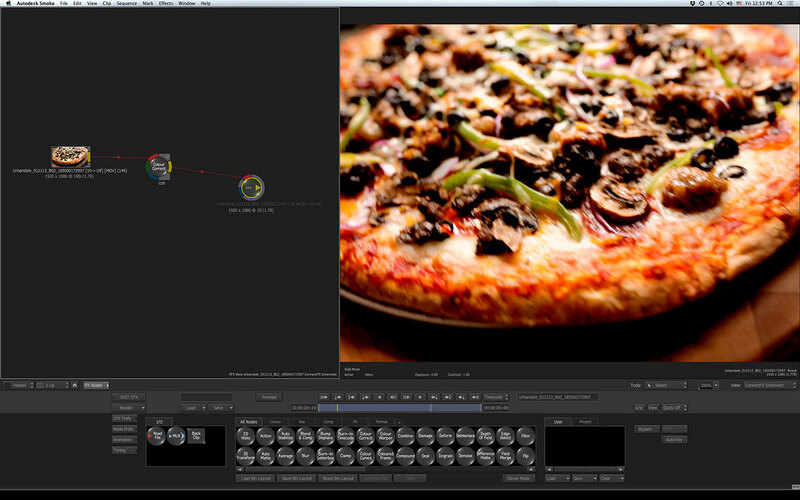 The hallmark of working with visual effects inside Smoke is the integration of a node-base compositing tool. That can also be the most daunting part of the learning curve for new users. Building on the 2013 version, Smoke 2015 has increased the amount of effects control that you can perform in the timeline, without touching any nodes. It uses a “ribbon” of common effects that can be applied to a clip and adjusted without ever leaving the timeline display. These consist of 14 effects modules that include most of the text, transform/DVE, color correction, and speed change effects commonly used by editors. For instance, you can apply a color correction to a clip or an adjustment layer, and then alter the look by numerical entry (keypad or mouse slider). You get a lot of correction control right within this ribbon, including access to master/highlight/mids/shadows and RGB/red/green/blue parameters. If you want more control with color wheels, then simply enter the effect editor to switch to that layout for the selected clip. Smoke had included a third-party effects API (Sparks), but other than GenArts, never had many takers among the development community interested in rewriting their Sparks Linux plug-ins (originally developed for Flame and Smoke on Linux) into Mac versions for Smoke on the Mac. Not many users bought the ones that were available. As a result, Autodesk has moved away from this API for Smoke, even though the effects tab is still there. Instead, Autodesk engineers filled in the gaps through additional effects that now come with Smoke. The bottom line is that although there’s a Sparks tab in the ribbon, it’s a legacy item with no functionality without third-party plug-ins. Smoke has undergone a big performance improvement since its original Mac introduction. In the past, you could usually only play a timeline clip in real-time, when the clip had no more than a single effect applied to it. Add more effects and rendering was needed. Now it’s possible to apply several effects to a clip and still play through it without rendering. This is based on my testing on a 2009 8-core Mac Pro with 28GB of RAM and an ATI 5870 GPU card. To enable new users to adapt more quickly to complex composites and to add effects not supplied by third parties, Smoke 2015 includes a number of presets. For example, if you add a lens flare, there’s a wide range of preset styles accessible from a pulldown menu. When you set up a chromakey, you can start with a preset selection of nodes, designed to be a good starting point. Autodesk also added 3D camera tracking into Smoke 2015, which had been previously developed for Flame. In an effort to position Smoke as a finishing tool that works well with Apple Final Cut Pro X, Autodesk has improved the compatibility with FCPXML lists generated from that application. While this works reasonably well, I did have problems relinking to clips with frame rates that differed from the main sequence rate. For example, 60fps clips from a Canon 5D that were cut into a 23.98fps timeline and slowed, did not properly relink when I imported the sequence into Smoke. Overall, Smoke 2015 is a good upgrade. With a subscription you get updates as they come out. Unfortunately, this process is not as easy as it is with Apple, Adobe, or even Avid products. My software went from SP1 (service pack) to SP2. When I tried to download SP2, I could only find SP3. I tried this version, but it was incompatible, because that was designed for legacy perpetual license owners. I finally got SP2 installed, but only through the help of tech support. On the plus side, I’ve found Autodesk’s support personnel to be very helpful and knowledgeable, when I’ve needed them. Smoke does not support dual-display systems in the same way as its competitors. You can run the broadcast monitoring signal to a second display, which gives you full-screen video or a duplicate of the node tree in some modes; but, the user interface is not configurable across two screens like other NLEs. Smoke also accesses media differently than other NLEs, which conflicts with some of the Mac’s internal networking functions. I typically run with my internal Mac OS X firewall set to block all connections. This works fine with all creative applications, except Smoke. Set that way, all of the media is unlinked. Rather than reconfigure my settings to run Smoke (since my main use is for demo purposes), I simply turn off the internal firewall before launching Smoke. The long-term success of the subscription software business model among creative applications is still an unknown. Adobe and Autodesk are primarily on the vanguard – with Avid offering it only as one option. Among users, it’s still a love/hate thing. It will take a few years yet to see whether or not it’s the right move. Nevertheless, if you have the business to justify the cost and want to stay current with a top-notch editor/compositor, then a Smoke subscription might be right for you. If you are serious about Smoke 2015, then I would highly recommend Alexis Van Hurkman’s book, “Autodesk Smoke Essentials”, which may be purchased through the Autodesk website, as well as from Amazon.com. It’s the ideal quick start guide for users committed to learning Smoke. As we head toward the end of the year, it’s time to look again at a few items you can use to spruce up your edit bay. Let’s start at the computer. The “tube” Mac Pro has been out for nearly a year, but many will still be trying to get the most life out of their existing Mac Pro “tower”. I wrote about this awhile back, so this is a bit of a recap. More RAM, an internal SSD and an upgraded GPU card are the best starting points. OWC and Crucial are your best choices for RAM and solid state drives. If you want to bump up your GPU, then the Sapphire 7950 (Note: I have run into issues with some of these cards, where the spacer screws are too tall, requiring you to install the card in slot 2) and/or Nvidia GTX 680 Mac Edition cards are popular choices. However, these will only give you an incremental boost if you’ve already been running an ATI 5870 or Nvidia Quadro 4000 display card. If you have the dough and want some solid horsepower, then go for the Nvidia Quadro K5000 card for the Mac. To expand your audio monitoring, look at Mackie mixers, KRK speakers and the PreSonus Audiobox USB interface. Naturally there are many video monitor options, but assuming you have an AJA or Blackmagic Design interface, FSI would be my choice. HP Dreamcolor is also a good option when connecting directly to the computer. The video plug-in market is prolific, with plenty of packages and/or individual filters from FxFactory, Boris, GenArts, FCP Effects, Crumplepop, Red Giant and others. I like the Universe package from Red Giant, because it supports FCP X, Motion, Premiere Pro and After Effects. Red Giant continues to expand the package, including some very nice new premium effects. If you are a Media Composer user, then you might want to look into the upgrade from Avid FX to Boris Red. Naturally, you can’t go wrong with FxFactory, especially if you use FCP X. There’s a wide range of options with the ability to purchase single filters – all centrally managed through the FxFactory application. For audio, the go-to filter companies are iZotope, Waves and Focusrite to name a few. 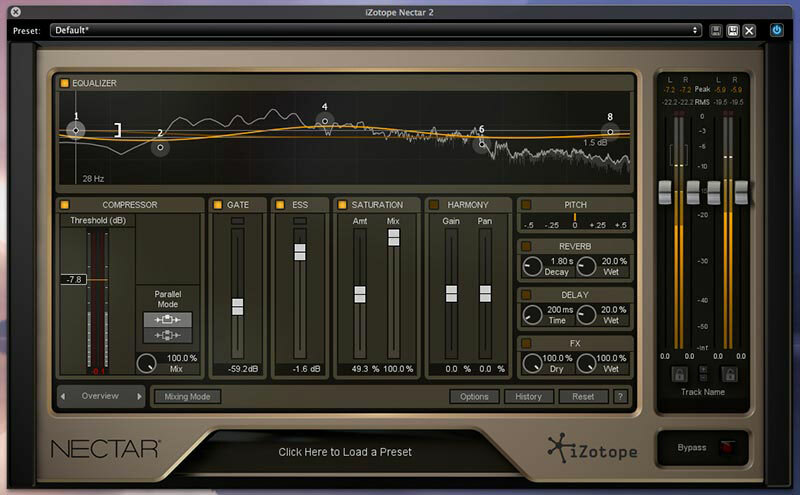 iZotope released some nice tools in its RX4 package – a state-of-the-art repair and restoration suite. If you just want a suite of EQ and compression tools, then Nectar Elements or Nectar 2 are the best all-in-one collections of audio filters. While most editors do their audio editing/mastering within their NLE, some need a bit more. Along with a 2.0 bump for Sound Forge Pro Mac, Sony Creative Software also released a standard version of Sound Forge through the Mac App Store. In the color correction world, there’s been a lot of development in film emulation look-up tables (LUTs). These can be used in most NLEs and grading applications. If that’s for you, check out ImpulZ and Osiris from Color Grading Central (LUT Utility required with FCP X), Koji Color or the new SpeedLooks 4 (from LookLabs). Each package offers a selection of Fuji and Kodak emulations, as well as other stylized looks. These packages feature LUT files in the .cube and/or .look (Adobe) LUT file formats and, thus, are compatible with most applications. If you want film emulation that also includes 3-way grading tools and adjustable film grain, your best choice is FilmConvert 2.0. Another category that is expanding covers the range of tools used to prep media from the camera prior to the edit. This had been something only for DITs and on-set “data wranglers”, but many videographers are increasingly using such tools on everyday productions. These now offer on-set features that benefit all file-based recordings. 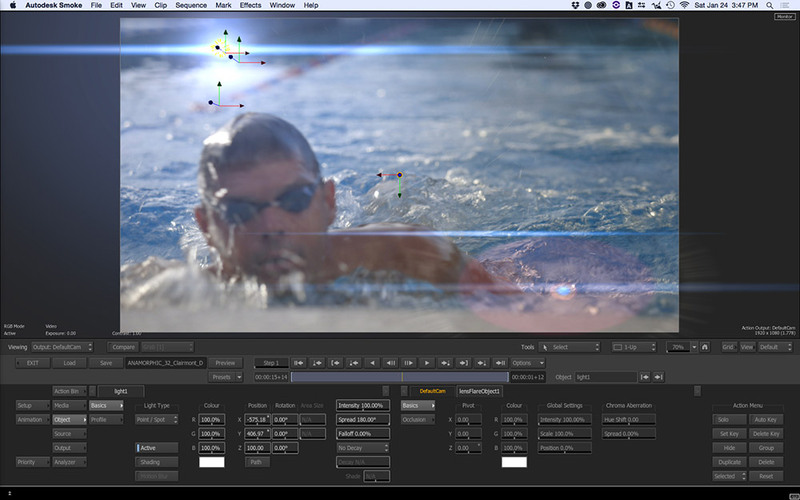 Pomfort Silverstack, ShotPut Pro, Redcine-X Pro and Adobe Prelude have been joined by new tools. To start, there’s Offload and EditReady, which are two very specific tools. Offload simply copies and verifies camera-card media to two target drives. EditReady is a simple drag-and-drop batch convertor to transcode media files. These join QtChange (a utility to batch-add timecode and reel IDs to media files) and Better Rename (a Finder renaming utility) in my book, as the best single-purpose production applications. If you want more in one tool, then there’s Bulletproof, which has now been joined in the market by Sony Creative Software’s Catalyst Browse and Prepare. Bulletproof features media offload, organization, color correction and transcoding. I like it, but my only beef is that it doesn’t properly handle timecode data, when present. Catalyst Browse is free and similar to Canon’s camera utility. It’s designed to read and work with media from any Sony camera. Catalyst Prepare is the paid version with an expanded feature set. It supports media from other camera manufacturers, including Canon and GoPro. Finally, many folks are looking for alternative to Adobe Photoshop. I’m a fan of Pixelmator, but this has been joined by Pixlr and Mischief. All three are available from the Mac App Store. Pixlr is free, but can be expanded through subscription. 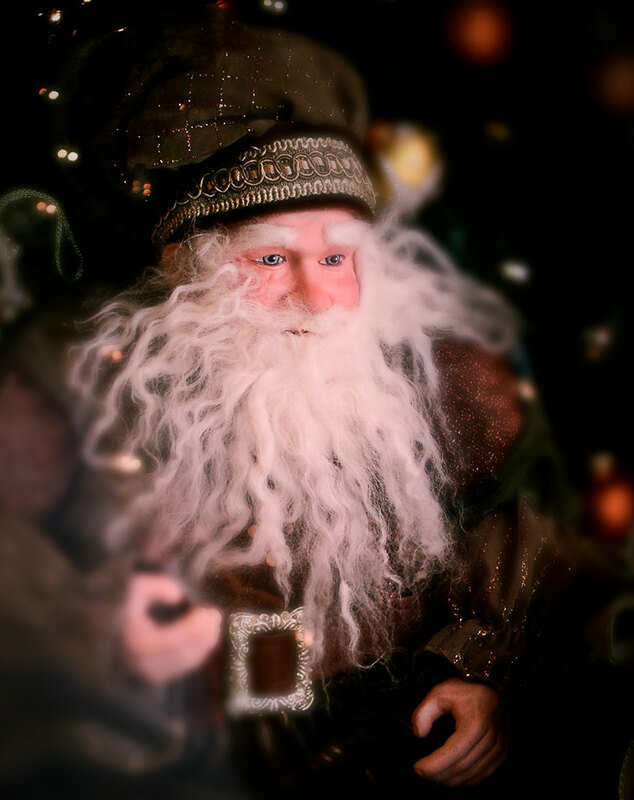 In its basic form, Pixlr is a stylizing application that is like a very, very “lite” version of Photoshop; however, it includes some very nice image processing filters. Mischief is a drawing application designed to work with drawing tablets, although a mouse will work, too. Whodathunkit? More NLEs, new cameras from new vendors and even a new film scanner! I’ve been back from NAB for a little over a week and needed to get caught up on work while decompressing. The following are some thoughts in broad strokes. Avid Connect. My trip started early with the Avid Connect costumer event. This was a corporate gathering with over 1,000 paid attendees. Avid execs and managers outlined the corporate vision of Avid Everywhere in presentations that were head-and-shoulders better than any executive presentations Avid has given in years. For many who attended, it was to see if there was still life in Avid. I think the general response was receptive and positive. Avid Everywhere is basically a realignment of existing and future products around a platform concept. That has more impact if you own Avid storage or asset management software. Less so, if you only own a seat of Media Composer or ProTools. No new software features were announced, but new pricing models were announced with options to purchase or rent individual seats of the software – or to rent floating licenses in larger quantities. 4K. As predicted, 4K was all over the show. However, when you talked to vendors and users, there was little clear direction about actual mastering in 4K. It is starting to be a requirement in some circles, like delivering to Netflix, for example; but for most users 4K stops at acquisition. There is interest for archival reasons, as well as for reframing shots when the master is HD or 2K. Cameras. New cameras from Blackmagic Design. Not much of a surprise there. One is the bigger, ENG-style URSA, which is Blackmagic’s solution to all of the add-ons people use with smaller HDSLR-sized cameras. The biggest feature is a 10” flip-out LCD monitor. AJA was the real surprise with its own 4K Cion camera. Think KiPro Quad with a camera built around it. Several DPs I spoke with weren’t that thrilled about either camera, because of size or balance. A camera that did get everyone jazzed was Sony’s A7s, one of their new Alpha series HDSLRs. It’s 4K-capable when recorded via HDMI to an external device. The images were outstanding. Of course, 4K wasn’t everywhere. Notably not at ARRI. The news there is the Amira – a sibling to the Alexa. Both share the same sensor design, with the Amira designed as a documentary camera. I’m sure it will be a hit, in spite of being a 2K camera. Mac Pro. The new Mac Pro was all over the show in numerous booths. 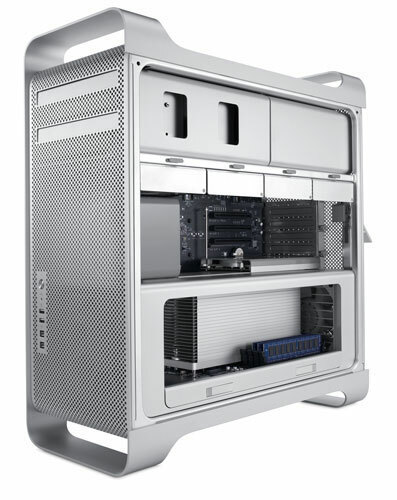 Various companies showed housings and add-ons to mount the Mac Pro for various applications. Lots of Thunderbolt products on display to address expandability for this unit, as well as Apple laptops and eventually PCs that will use Thunderbolt technology. The folks at FCPworks showed a nice DIT table/cart designed to hold a Mac Pro, keyboard, monitoring and other on-set essentials. FCP X. Speaking of FCP X, the best place to check it out was at the off-site demo suite that FCPworks was running during the show. 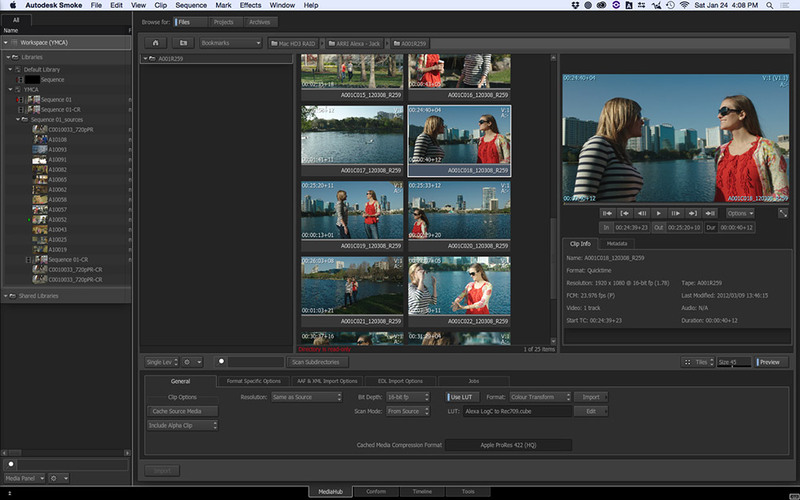 The suite demonstrated a number of FCP X-based workflows using third-party utilities, shared storage from Quantum and more. FCP X was in various booths on the NAB show floor, but to me it seemed limited to partner companies, like AJA. I thought the occurrences of FCP X in other booths was overshadowed by Premiere Pro CC sightings. No new FCP X feature announcements or even hints were made by Apple in any private meetings. NLEs. The state of nonlinear editing is in more flux than ever. FCP X seems to be picking up a little steam, as is Premiere Pro. Yet, still no clear market leader across all sectors. Autodesk announced Smoke 2015, which will be the last version you can buy. Following Adobe’s lead, this year they shift to a rental model for their products. Smoke 2015 diverges more from the Flame UI model with more timeline-based effects than Smoke 2013. Lightworks for the Mac was demoed at the EditShare booth, which will make it another new option for Mac editors. Nothing new yet out of Avid, except some rebranding – Media Composer is now Media Composer | Software and Sphere is now Media Composer | Cloud. Expect new features to be rolled in by the end of this year. 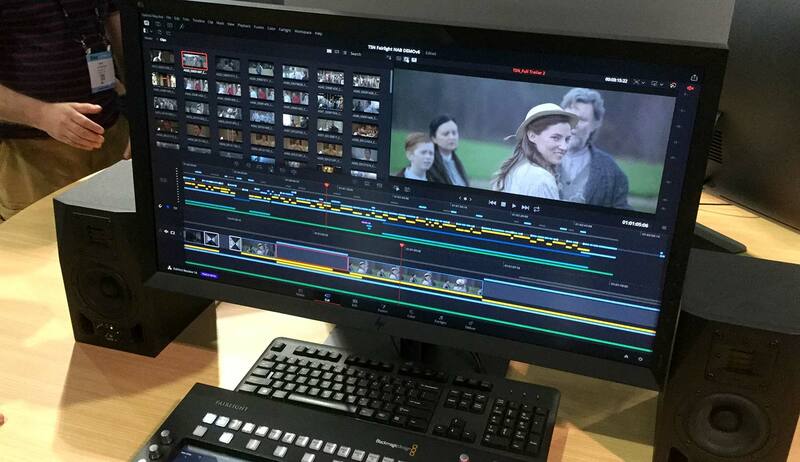 The biggest new player is Blackmagic Design, who has expanded the DaVinci Resolve software into a full-fledged NLE. With a cosmetic resemblance to FCP X, it caused many to dub it “the NLE that Final Cut Pro 8 should have been”. Whether that’s on the mark or just irrational exuberance has yet to be determined. Suffice it to say that Blackmagic is serious about making it a powerful editor, which for now is targeted at finishing. Death of i/o cards. I’ve seen little mention of this, but it seems to me that dedicated PCIe video capture cards are a thing of the past. KONA and Decklink cards are really just there to support legacy products. They have less relevance in the file-based world. Most of the focus these days is on monitoring, which can be easily (and more cheaply) handled by HDMI or small Thunderbolt devices. If you looked at AJA and Matrox, for example, most of the target for PCIe cards is now to supply the OEM market. AJA supplies Quantel with their 4K i/o cards. The emphasis for direct customers is on smaller output-only products, mini-converters or self-contained format converters. Film. If you were making a custom, 35mm film scanner – get out of the business, because you are now competing against Blackmagic Design! Their new film scanner is based on technology acquired through the purchase of Cintel a few months ago. Now Blackmagic introduced a sleek 35mm scanner capable of up to 30fps with UltraHD images. It’s $30K and connects to a Mac Pro via Thunderbolt2. Simple operation and easy software (plus Resolve) will likely rekindle the interest at a number of facilities for the film transfer business. That will be especially true at sites with a large archive of film. Social. Naturally NAB wouldn’t be the fun it is without the opportunity to meet up with friends from all over the world. That’s part of what I get out of it. For others it’s the extra training through classes at Post Production World. The SuperMeet is a must for many editors. The Avid Connect gala featured entertainment by the legendary Nile Rodgers and his band Chic. Nearly two hours of non-stop funk/dance/disco. Quite enjoyable regardless of your musical taste. So, another year in Vegas – and not quite the ho-hum event that many had thought it would be! Click here for more analysis at Digital Video’s website. Autodesk attracted a lot of attention last year with the revamped version of Smoke for Mac OS X. I had originally been working on a review with the earlier version (Smoke 2012), but held off when I found out Smoke 2013 was just around the corner. Indeed, the more “Mac-like” refresh wowed NAB attendees, but it took until December to come to market. In that time, Autodesk built on the input received from users who tested it during this lengthy public beta period. Now that it’s finally out in the wild, I’ve had a chance to work with the release version, both on my own system, as well as at a client site where Smoke 2013 has been deployed. Both of these are on recent model Mac Pros. Although Smoke 2013 is a very deep application, I would offer that the learning curve for this new version is a mere 25% of what it used to be. That’s a significant improvement. There are several ways to install and operate Smoke 2013. Most users will install the application in the standalone mode. The software is activated over the internet and works only on that licensed machine. Facility users can also purchase license server software, which allows them to float the Smoke license among several machines. Only one at a time is activated, but any of the machines can run the software, based on the permission assigned by the license server application over the internal LAN. Smoke 2013 operation is tied to the media storage, so the first thing to do after software installation is to run the Smoke set-up utility. This allocates which drives are accessible to Smoke. You can grab media files from any connected drive, but specific locations must be assigned as library locations for media caches, proxies, render files and so on. These can be internal drives, SAN volumes or externally-connected drives. The key is that when you create or launch a project, it is tied to a specific library location. If that drive is unmounted, any projects associated with it won’t show up and are not accessible (even in an offline mode) to the operator. You should approach Smoke operation with a media strategy in mind. Smoke 2013 handles more native codecs and file formats – and in a more straightforward fashion – than Smoke 2012. If you are working with ProRes media, for instance, no conversion is necessary to get started in Smoke and files can be rendered as ProResHQ, instead of the previous default of uncompressed DPX files. This means drive performance requirements are less than in the past, but it’s still a good idea to use fast RAID arrays. Even two 7200RPM SATA drives striped as RAID-0 will give you acceptable performance with ProRes media. Naturally, a faster array is even better. Smoke will let you render intermediate proxies for even better performance, but if you want to simply drag in new media from the Mac Finder, then Smoke 2013 now performs on par with other desktop NLEs. Smoke uses OpenGL and not CUDA or OpenCL acceleration, so performance from ATI or NVIDIA cards is on even footing. If you run a dual monitor system, like my set-up with two 20” Apple Cinema Displays, you can enable dual-screen preview. This will let you mirror the UI or display a selected viewport, which is most often the current clip, but can also be the ConnectFX schematic. You are best off with two 1920×1080 or 1920×1200 screens. The scaling function to reduce the full screen viewer to fit my 1680×1050 resolution introduced artifacts and affected the performance of the card. Smoke 2013 can work with screen resolutions starting at 1440×900, but it’s better to stick to one higher resolution screen like a single 27” or 30” Apple Cinema Display or iMac screen. It’s best to run a broadcast monitor connected to an AJA KONA, IoXT or Blackmagic Design card (in a future version). In that configuration, you can’t use a second computer display to extend the real estate of the Smoke user interface, but could display the UI from another open application, like Adobe Photoshop. The reaction to Apple Final Cut Pro X kicked up interest in Smoke. Users who wanted a 64-bit, track-based application that didn’t stray too far from FCP 7’s operational style, felt that Smoke 2013 might be the hypothetical “FCP 8”. Autodesk indeed sports an editing workspace that is closely aligned with the look and feel of Final Cut Pro “legacy”, as well as Adobe Premiere Pro. It even defaults to FCP 7 keyboard shortcut commands. If you can edit on Final Cut (before FCP X) or Premiere Pro, then you can be productive on Smoke with little relearning. The user interface is divided into three panes – a browser, a viewing area and a workspace. 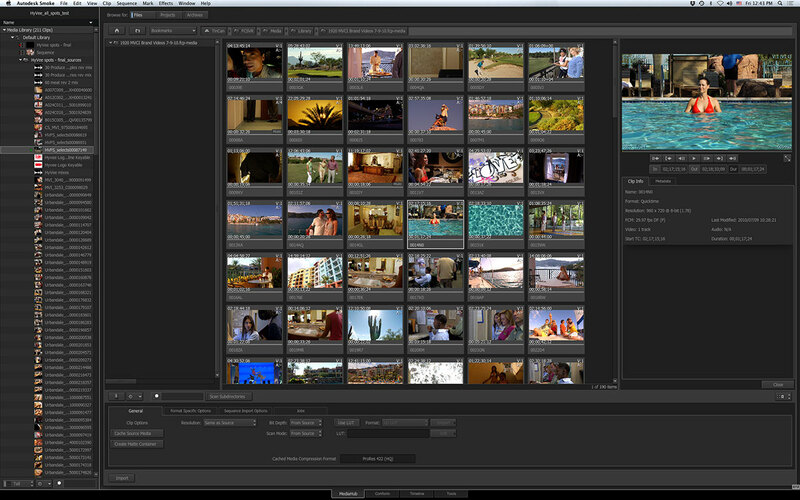 Across the bottom are four tabbed interface pages or modes – MediaHub, Conform, Timeline and Tools. MediaHub is where you search drive locations for files. It is analogous to Adobe’s Media Browser within Premiere Pro. Locate files and drag or import them into the editing browser window. Conform lets you reconcile imported media with edit lists and is also a place to relink media files. Timeline is the standard editing workspace and lastly, Tools holds clip tools and utilities, such as deinterlacing, pulldown, etc. Each pane changes the information displayed, based on the context of that mode. In the Timeline mode, you see viewers and a timeline, but in the MediaHub mode each pane shows completely different information. Editors will spend most of their day in the Timeline mode. This interface page is organized into the standard editing view with player windows at the top and a track-based timeline at the bottom. Smoke always loads at least two timelines – the edited sequence and the selected source clip. Effects can be applied to the source clip, as well as to clips on the timeline. 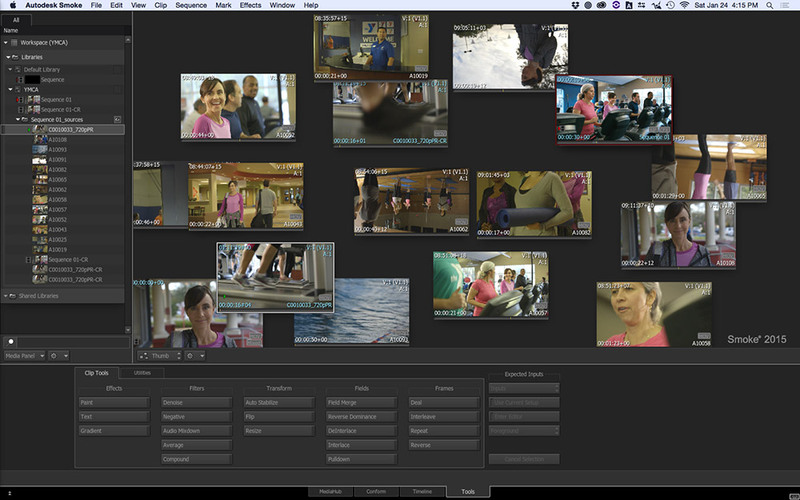 The viewer pane can display clips on a single, toggled viewer (like FCP X) or traditional source/record windows (like FCP 7). There’s also a thumbnail and a triptych view. The latter is helpful during color correction, if you want to display previous/current/next frames for shot matching. The browser displays all imported source clips for a project. It can be placed on the left, on the right or hidden entirely. Within it, clips can be organized into folders. You may have more than one sequence in a project, but only one project can be open at a time. As you select a clip, it immediately loads into the viewer and timeline window. No double-clicking required. Smoke is a good, fast editor when it comes to making edits and adjusting clips on the timeline. There are some nice touches overlooked on other NLEs. For example, it uses track-based audio editing with keyframable real-time mixing. There are a set of audio filters that can be applied and the output has a built-in limiter. Formatting for deliverables is built into the export presets, so exporting a 1080p/23.976 sequence as 720p is as simple as picking a preset. The edit commands include the standard insert, overwrite and replace functions, but also some newer ones, like append and prepend. Ripple and snapping are simple on/off toggles. While editing is solid, I would still categorize Smoke 2013 as a finishing tool. You could edit a long-form project from scratch in Smoke, but you certainly wouldn’t want to. It lacks the control needed for narrative long-form, like detailed custom bin columns, a trim tool, multi-camera editing and more. On the other hand, a scripted short-form project, like a TV commercial – especially one requiring Smoke’s visual effects tools – could be edited exclusively within Smoke. The better approach is to do your rough cuts in another desktop NLE and then send it to Smoke for the remainder. You can import various edit list formats – EDL, XML, FCPXML and AAF. Cut on Final Cut Pro 7/X, Premiere Pro or Media Composer and export an edit decision list in one of these formats for the sequence. Then import and link files in Smoke and you are ready to go. In my testing, XMLs from both FCP 7 and FCP X worked really well, but AAFs from Media Composer were problematic. Typically Smoke had difficulty in relinking media files when it was an Avid project, most likely due to issues in the AAF. 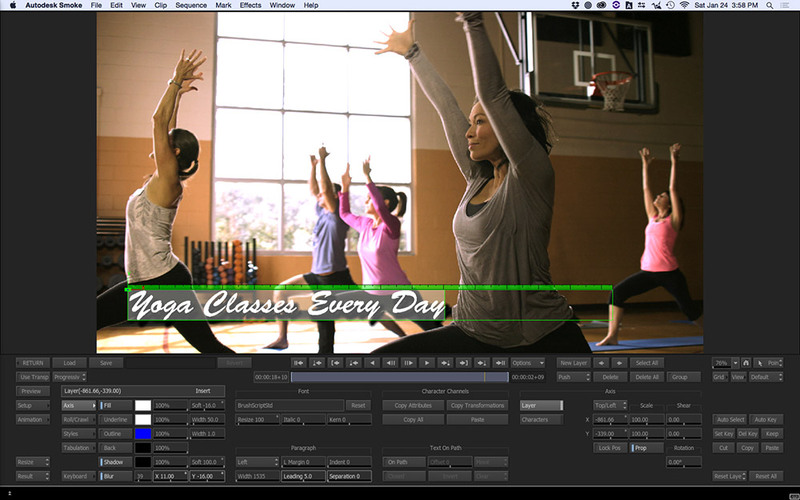 The visual effects tools are the big reason most editors would use Smoke 2013 over another NLE. There are four ways to apply effects. The first and easiest is the effects “ribbon” that flies out between the viewers and the timeline. It contains eight standard effects groups – Timewarp, Resize, Text, Color Correction, Spark, Blend, Wipe and Axis. (Spark is the API for third party filters. GenArts Sapphire is the first effects package for Smoke 2013.) The “ribbon” effects are always applied in the same order and some are multiple purpose tools. For instance, the Resize effect is automatically applied for format correction, such as a ProRes4444 clip in a ProResHQ timeline. When these effects are added to a clip on the timeline, a reduced set of parameters appears in a fly-out panel at the top of the timeline. You can immediately apply and adjust effects in the timeline without the need to step deeper until you’ve mastered the simpler methods. The last effect, Axis, is a “super tool”. It’s the 2.5/3D DVE effect, but you can enter its effects editor and do a whole lot more. Axis lets you add text, lighting, 3D cameras, plus adjust surface properties and surface deformations. Once you enter any of the effects editors, the mode changes and you are in a new user interface specific to the context of that effect. The controls flow left to right and change options according to the selections made. For instance, picking “object” within the Axis effect editor gives you controls to adjust the scale, position and rotation of the clip. Pick “lights” and the control parameters change to those appropriate for lighting. The third way to build an effect is to select ConnectFX. This brings you into Smoke’s world of node-based composting, where you are presented with a flow chart schematic, a viewer and a set of filter tools. An effect like Color Correction may be applied directly to the timeline as a single filter or as a filter within a ConnectFX build. It’s entirely up to the comfort level of the editor and how many additional effects will be applied to that clip for the final look. One of available tools within the set is Action, which is a separate compositing method. It forms the fourth way to build effects. You can composite multiple media clips in an Action node, such as a title over a background. Once you step into an Action node, you are presented with its own schematic. Instead of a flowchart, the Action schematic shows parent-child links between layers of the composite, such as a light that is attached to a media clip. Action is where you would make adjustments in 3D camera space. Some tools, like the 3D lens flare effect are only available in Action. Smoke detractors make a big deal out of the need to render everything. While this is true, I found that a single effect applied from the FX “ribbon” menu to a clip on the timeline will play in real time. If you’ve applied more than one effect to a clip, then usually the last one in this string will be displayed live during playback. When rendering is required, the processing speed is pretty quick. If you export a sequence with unrendered effects, then all effects are first processed (rendered) before the finished, flattened master file is exported. 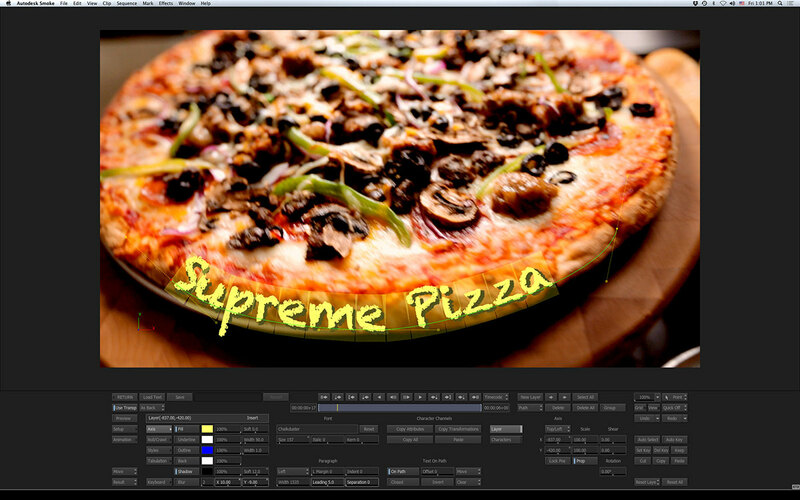 Smoke 2013 is likely to be one of the deepest, but powerful, editing applications you will ever encounter. It’s deceptively simple to start, but takes a concentrated effort to master the inner workings of its integrated, node-based compositors. Nevertheless, you can start to be productive without having to tackle those until you are ready. In an editing world that’s gravitating towards an ever-growing number of canned, one-button preset effects, Smoke 2013 unabashedly gives you the building blocks needed for that last 5% of finesse, not available from a preset effect. You can even build your own complex presets to be applied on future projects. That takes time and talent to master. Fortunately Autodesk has gone the extra mile with good tutorials available on their Area community site and the Smoke Learning Channel on YouTube. Smoke is ideal as a finishing tool in a multi-suite facility, the main system in a creative media shop or the go-to system for broadcast promotion production. It is designed to fulfill the “hero” role and is targeted squarely at the Adobe suite of tools. The sales pitch is to stay within Smoke’s integrated environment rather than bounce among several applications. While Smoke 2013 largely meets that objective, it still gets down to personal preferences – compositing in nodes versus a track-based tool like After Effects. Installation is easier than it was, but I’d still like to see Autodesk improve on the activation process – especially for those interested in using more than one machine. Smoke uses a Unix-style file structure, so project files (other than media index and render files) are hidden from the user. This makes it difficult to move projects from one computer to the next. Smoke 2013 lives up to the commitment made at NAB 2012, but now that it’s a released product, Autodesk has a chance to hone the tool to be more in line with the needs of the target user. It’s been 18 months since Apple launched Final Cut Pro X and the debate over it continues to rage without let-up. Apple likely has good sales numbers to deem it a success, but if you look around the professional world, with a few exceptions, there has been little or no adoption. Yes, some editors are dabbling with it to see where Apple is headed with it – and yes, some independent editors are using it for demanding projects, including commercials, corporate videos and TV shows. By comparison, though, look at what facilities and broadcasters are using – or what skills are required for job openings – and you’ll see a general scarceness of FCP X.
Let’s compare this to the launch of the original Final Cut Pro (or “legacy”) over 12 years ago. 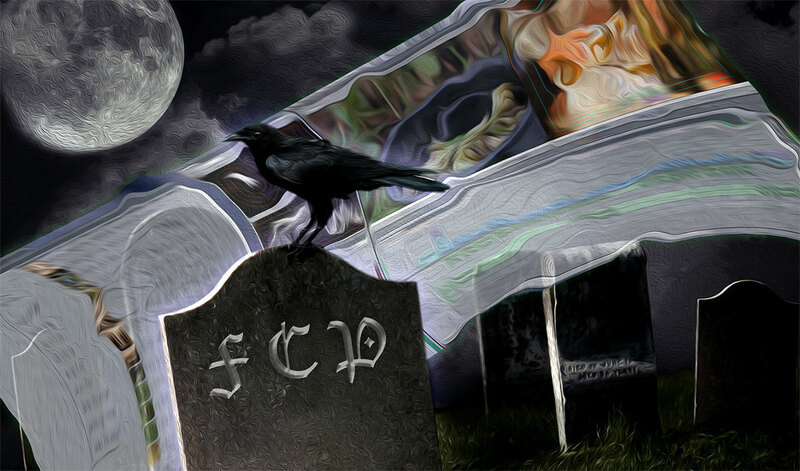 In a similar fashion, FCP was the stealth tool that attracted individual users. The obvious benefit was price. At that time a fully decked out Avid Media Composer was a turnkey system costing over $100K. FCP was available as software for only $999. Of course, what gets lost in that measure, is the Avid price included computer, monitors, wiring, broadcast i/o hardware and storage. All of this would have to be added to the FCP side and in some cases, wasn’t even possible with FCP. In the beginning it was limited to DV and FireWire only. But there were some key advantages it introduced at the start, over Avid systems. These included blend modes, easy in-timeline editing, After Effects-style effects and a media architecture built upon the open, extensible and ubiquitous QuickTime foundation. Over the years, a lot was added to make FCP a powerful system, but at its core, all the building blocks were in place from the beginning. When uncompressed SD and next HD became the must-have items, Avid was slow to respond. Apple’s partners were able to take advantage of the hardware abstraction layer to add codecs and drivers, which expanded FCP’s capabilities. Vendors like Digital Voodoo, Aurora Video Systems and Pinnacle made it possible to edit something other than DV. Users have them to thank – more so than Apple – for growing FCP into a professional tool. When FCP 5 and 6 rolled around, the Final Cut world was pretty set, with major markets set to shift to FCP as the dominant NLE. HD, color correction and XML interchange had all been added and the package was expanded with an ecosystem of surrounding applications. By the time of the launch of the last Final Cut Studio (FCP 7) in 2009, Apple’s NLE seemed unstoppable. Unfortunately FCP 7 wasn’t as feature-packed as many had expected. Along with reticence to chuck recently purchased PowerMac G5 computers, a number of owners simply stayed with FCP 5 and/or FCP 6. When Apple discusses the number of licensees, you have to parse how they define the actual purchases. While there are undoubtedly plenty of FCP X owners, the interpretation of sales is that more seats of FCP X have been sold than of FCP 7. Unfortunately it’s hard to know what that really means. Since it’s a comparison to FCP 7 – and not every FCP 1-6 owner upgraded to 7 – it could very well be that the X number isn’t all that large. Even though Apple EOL’ed (end of life) Final Cut Studio with the launch of FCP X, it continued to sell new seats of the software through its direct sales and reseller channels. In fact, Apple seems to still have it available if you call the correct 800 line. When Apple says it has sold more of X than of 7, is it counting the total sales (including those made after the launch) or only before? An interesting statistic would be the number of seats of Final Cut Studio (FCP 7) sold since the launch of FCP X as compared to before. We’ll never know, but it might actually be a larger number. All I know is that the system integrators I personally know, who have a long history of selling and servicing FCP-based editing suites, continue to install NEW FCP 7 rooms! Like most drastic product changes, once you get over the shock of the new version, you quickly realize that your old version didn’t instantly stop working the day the new version launched. In the case of FCP 7, it continues to be a workhorse, albeit the 32-bit architecture is pretty creaky. Toss a lot of ProRes 4444 at it and you are in for a painful experience. There has been a lot of dissatisfaction with FCP X among facility owners, because it simply changes much of the existing workflows. There are additional apps and utilities to fill the gap, but many of these constitute workarounds compared to what could be done inside FCP 7. Many owners have looked at alternatives. These include Adobe Premiere Pro, Avid Media Composer/Symphony, Media 100 and Autodesk Smoke 2013. If they are so irritated at Apple as to move over to Windows hardware, then the possibilities expand to include Avid DS, Grass Valley Edius and Sony Vegas. Several of these manufacturers have introduced cross-grade promotional deals to entice FCP “legacy” owners to make the switch. Avid and Adobe have benefited the most in this transition. Editors who were happy with Avid in the past – or work in a market where Avid dominates – have migrated back to Media Composer. Editors who were hoping for the hypothetical FCP 8 are often making Adobe Premiere (and the Production Premium bundle) their next NLE of choice. But ironically, many owners and users are simply doing nothing and continuing with FCP 7 or even upgrading from FCP 6 to FCP 7. Why is it that FCP 7 isn’t already long gone or on the way out by now? Obviously the fact that change comes slowly is one answer, but I believe it’s more than that. When FCP 1.0 came on the scene, its interface and operational methodology fit into the existing NLE designs. It was like a “baby Avid” with parts of Media 100 and After Effects dropped in. If you cut on a Media Composer, the transition to FCP was pretty simple. Working with QuickTime made it easy to run on most personal machines without extra hardware. Because of its relatively open nature and reliance in industry-standard interchange formats (many of which were added over time), FCP could easily swap data with other applications using EDLs, OMFs, text-based log files and XML. Facilities built workflows around these capabilities. FCP X, on the other hand, introduced a completely new editing paradigm that not only changed how you work, but even the accepted nomenclature of editing. Furthermore, the UI design even did things like reverse the behavior of some keystrokes from how similar functions had been triggered in FCP 7. In short, forget everything you know about editing or using other editing software if you want to become proficient with FCP X. That’s a viable concept for students who may be the professional editors of the future. Or, for non-fulltime editors who occasionally have to edit and finish professional-level productions as one small part of their job. Unfortunately, it’s not a good approach if you want to make FCP X the ubiquitous NLE in established professional video environments, like post houses, broadcasters and large enterprise users. After all, if I’m a facility manager and you can’t show me a compelling reason why this is better and why it won’t require a complete internal upheaval, then why should I change? In most shops, overall workflow is far more important than the specific features of any individual application. Gone are the differences in cost, so it’s difficult to make a compelling argument based on ROI. You can no longer make the (false) argument of 1999 that FCP will only cost you 1% of the cost of an Avid. Or use the bogus $50K edit suite ad that followed a few years later. Which brings us to the present. I started on Avid systems as the first NLE where I was in the driver’s seat. I’ve literally cut on dozens of edit systems, but for me, Final Cut Pro “legacy” fit my style and preferences best. I would have loved a 64-bit version with a cleaned-up user interface, but that’s not what FCP X delivers. It’s also not exactly where Premiere Pro CS6 is today. I deal with projects from the outside – either sent to me or at shops where I freelance. Apple FCP 7 and Avid Media Composer continue to be what I run into and what is requested. Over the past few months I’ve done quite a few complex jobs on FCP X, when I’ve had the ability to control the decision. Yet, I cannot get through any complex workflow without touching parts of Final Cut Studio (“legacy”) to get the job done. 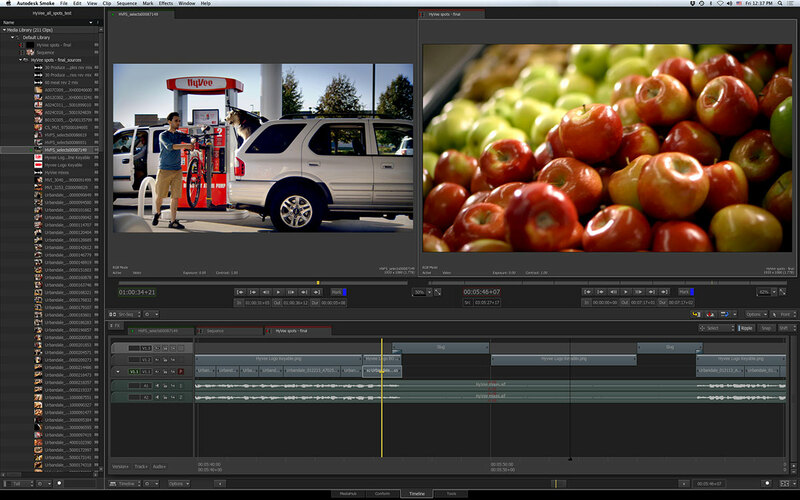 FCP X seems to excel at small projects where speed trumps precision and interoperability. It’s also great for individual owner-operators who intend to do everything inside FCP X. 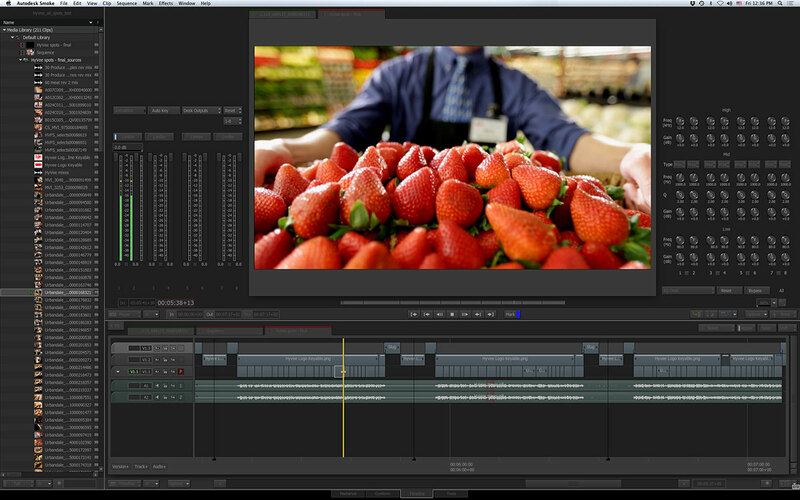 But for complex projects with integrated workflows, FCP 7 is still decidedly better. As was the case with early FCP, where most of the editing design was there at the start, I now feel that with the FCP X 10.0.6 update, most of its editing design is also in place. It may never become the tool that marches on to dominate the market. FCP “legacy” had that chance and Apple walked away from it. It’s dubious that lightning will strike twice, but 18 months is simply too short of a timeframe in which to say anything that definitive. All I know is that for now, FCP 7 continues as the preferred NLE for many, with Media Composer a close second. Most editors, like old dogs, aren’t too eager to learn new tricks. At least that’s what I conclude, based on my own ear-to-the-ground analysis. Check back this time next year to see if that’s still the case. For now, I see the industry continuing to live in a very fractured, multi-NLE environment. Get some coffee, sit back and take your time reading this post. I apologize for its length in advance, but there’s a lot of new hardware and software to talk about. I’m going to cover my impressions of NAB along with some “first looks” at Adobe Creative Suite 6, Smoke 2013 and Thunderbolt i/o devices. There’s even some FCP X news! I thought this year was going to be quiet and laid back. Boy, was I wrong! Once again Blackmagic Design stole the spotlight with democratized products. This year the buzz had to be the Blackmagic Cinema Camera. It delivers on the objective of the original RED Scarlet idea. It’s a $3K camera with 2.5K of resolution and 13 stops. I’ll leave the camera discussions to the camera guys, but suffice it to say that this camera was thought up with post in mind. That is – no new, proprietary codec. It uses ProRes, DNxHD or Cinema DNG (the Adobe raw format). It also includes a copy of Resolve and UltraScope with the purchase. Along with that news was Blackmagic’s re-introduction of the Teranex processors. Prior to that company’s acquisition by Blackmagic Design, the top-of-the-line Teranex image processor loaded with options was around $90K. Now that Grant Petty’s wizards have had a go at it, the newest versions in a nicely re-designed form factor are $2K for 2D and $4K for 3D. Sweet. And if you think free (or close to it) stifles R&D, take a look at the new, cleaned-up DaVinci Resolve 9.0 interface. Great to see that the development continues. You’ll note that there was a lot of buzz about 4K camera, but did you notice you need to record that image to something? Enter AJA – not with a camera – but, with the KiPro Mini Quad. That’s right – a 4K version of the Mini already designed with Canon’s C500 4K camera in mind. It records 4K ProRes 4444 files. AJA is also building its Thunderbolt portfolio with T-Tap, a monitoring-only Thunderbolt-to-SDI/HDMI output adapter under $250. More on Thunderbolt devices later in this post. 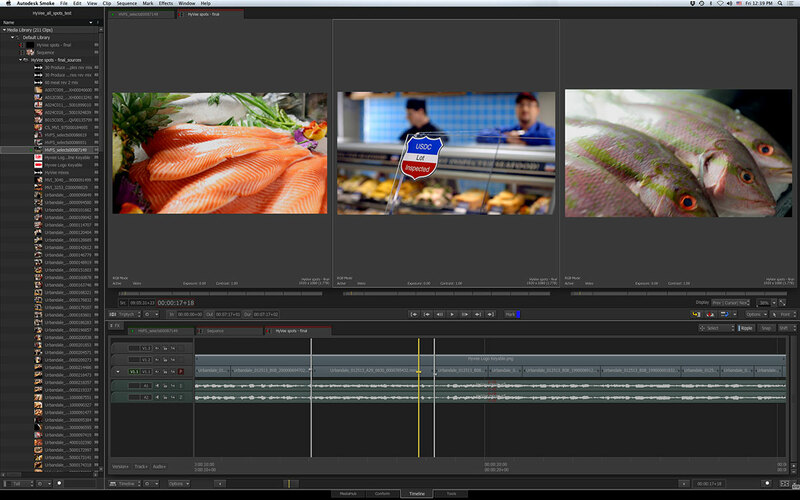 The NLE news was dominated by Adobe’s reveal of Creative Suite 6 (with Premiere Pro CS6) and Autodesk’s re-designed Smoke 2013. Avid’s news was mainly broadcast and storage-related, since Media Composer version 6 had been launched months before. 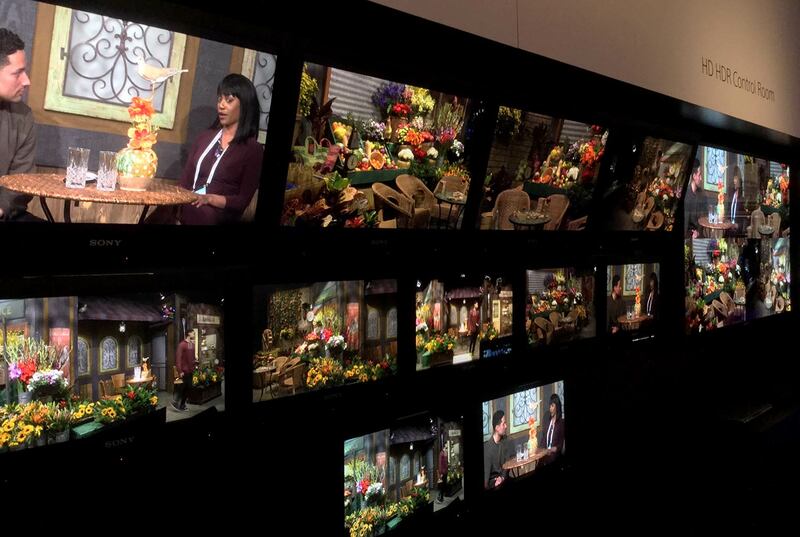 Although that was old news to the post crowd, it was the first showing for the software at NAB. Nevertheless, to guarantee some buzz, Avid announced a short-term Symphony cross-grade deal that lasts into June. FCP (excluding X), Media Composer and Xpress Pro owners can move into Symphony for $999. If you are an Avid fan, this is a great deal and is probably the best bang-for-the-buck NLE available if you take advantage of the cross-grade. An interesting sidebar is that both FilmLight and EyeOn are developing plug-in products for Avid software. 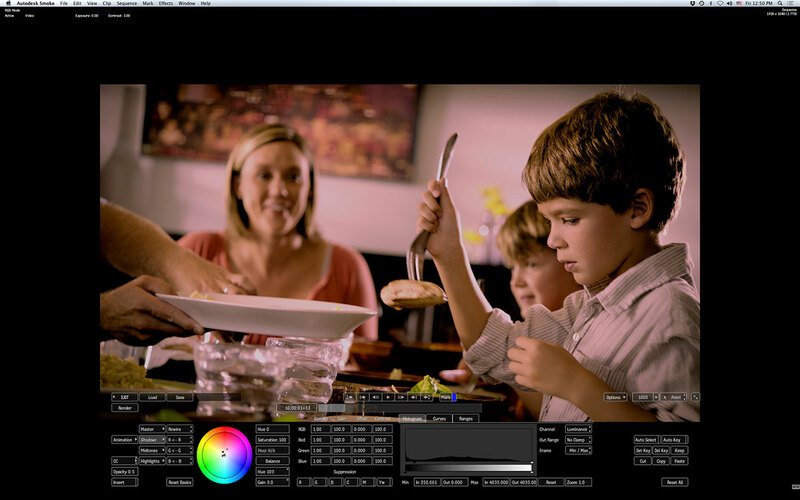 FilmLight builds the Baselight color correction system, which was shown and recently released in plug-in form for FCP 7. Now they are expanding that to other hosts, including Nuke and Media Composer under the product name of Baselight Editions. 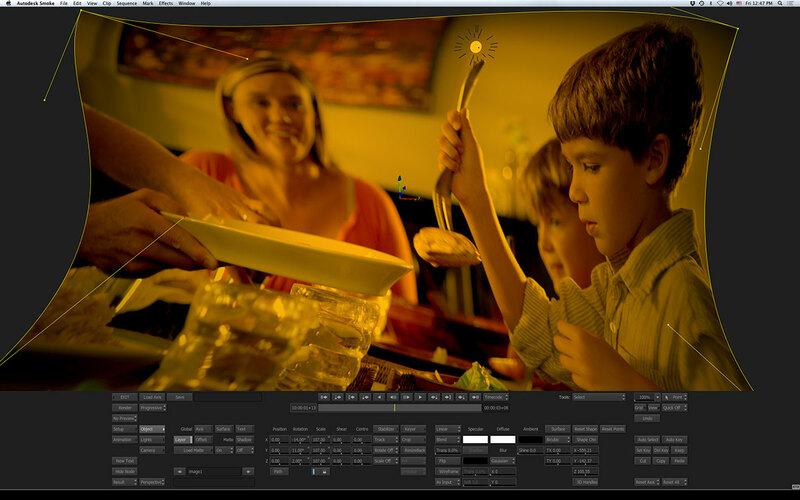 EyeOn’s Fusion software is probably the best and fastest, feature film-grade compositor available on Windows. EyeOn is using Connection (a software bridge) to send Media Composer/Symphony or DS timeline clips to Fusion, which permits both applications to stay open. In theory, if you bought Symphony and added Baselight and Fusion, the combination becomes one of the most powerful NLEs on the market. All at under $5K with the current cross-grade! 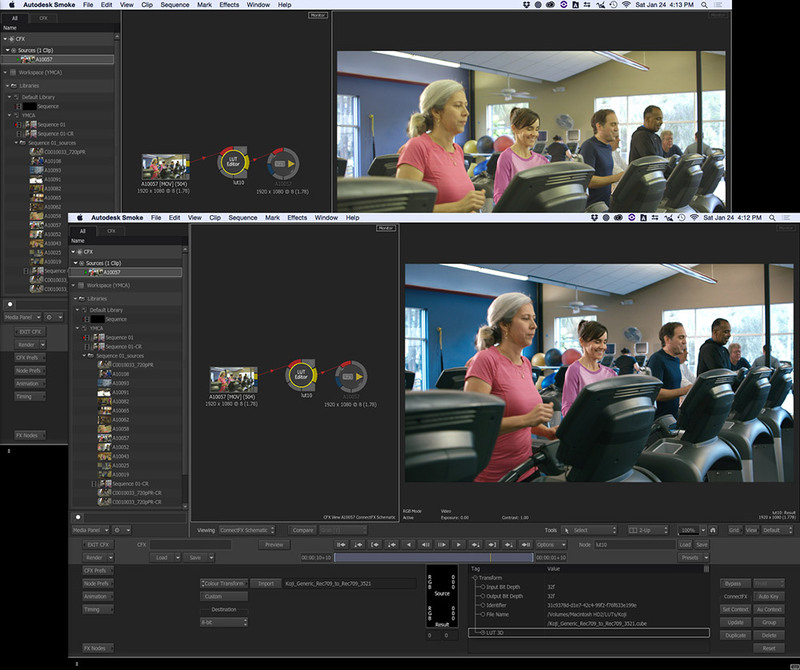 Autodesk has been quite busy redesigning its Smoke NLE for the Mac platform. Smoke 2013 features a complete Mac-centric overhaul to turn it into an all-in-one “super editor” that still feels comfortable for editors coming from an FCP or Media Composer background. See my “first look” section below. Quantel, who often gets lost in these desktop NLE discussions showed the software-only version of Pablo running on a tweaked PC. It uses four high-end NVIDIA cards for performance and there’s also a new, smaller Neo Nano control surface. Although pricing is lower, at $50K for the software alone, it’s still the premium brand. 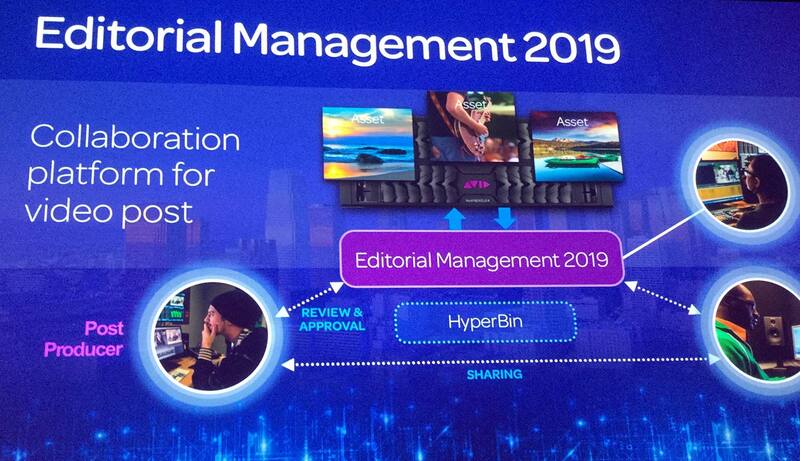 There’s been plenty of talk about “editing in the cloud”, but in my opinion, there were three companies at the show with viable cloud solutions for post: Avid, Quantel and Aframe. 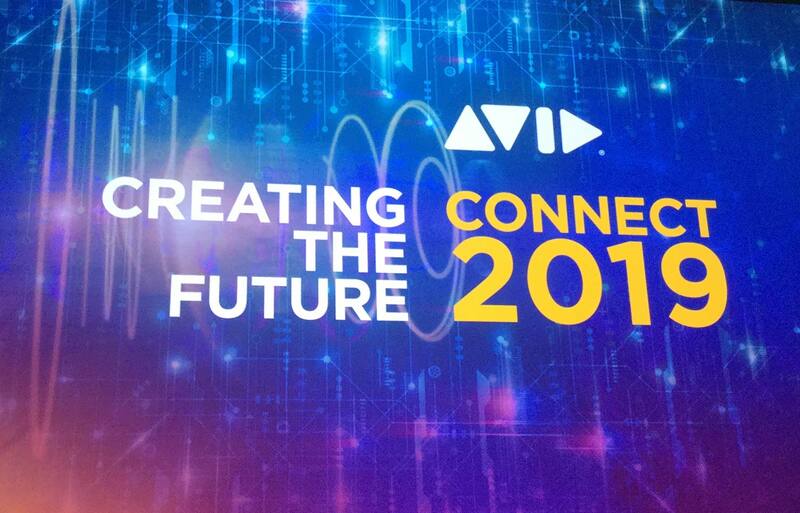 In 2010 Avid presented a main stage technology preview that this year has started to come to fruition as Interplay Sphere. The user in the field is connected to his or her home base storage and servers over various public networks. The edit software is a version of the NewsCutter/Media Composer interface that can mix local full-res media with proxy media linked to full-res media at the remote site. When the edit is done, the sequence list is “published” to the server and local, full-res media uploaded back to the home base (trimmed clips only). The piece is conformed and rendered by the server at home. Seems like the branding line should be Replace your microwave truck with a Starbucks! The company with a year of real experience “in the cloud” at the enterprise level is Quantel with Qtube. It’s a similar concept to Avid’s, but has the advantage of tying in multiple locations remotely. Media at the home base can also be searched and retrieved in formats that work for other NLEs, including Media Composer and Final Cut. An exciting newcomer is Aframe. They are a British company founded by the former owner of Unit, one of Europe’s largest professional post facilities built around FCP and Xsan. Aframe is geared toward the needs of shows and production companies more so than broadcast infrastructures. The concept uses a “private cloud” (i.e. not Amazon servers) with an interface and user controls that feel a lot like a mash-up between Vimeo and Xprove. Full-res media can be uploaded in several ways, including via regional service centers located around the US. There’s full metadata support and the option to use Aframe’s contracted logging vendor if you don’t want to create metadata yourself. 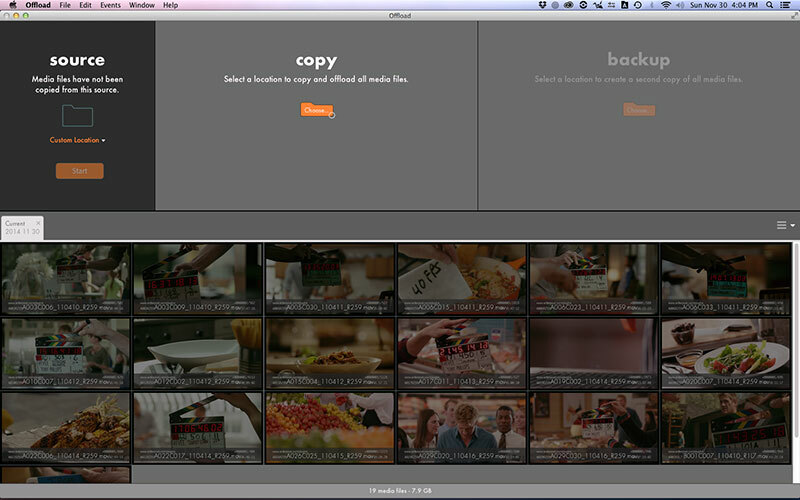 Editors cut with proxy media and then the full-res files are conformed via EDLs and downloaded when ready. Pricing plans are an attractive per-seat, monthly structure that start with a free, single seat account. Apple doesn’t officially do trade shows anymore, but they were at NAB, flying under the radar. In a series of small, private meetings with professional customers and media, Apple was making their case for Final Cut Pro X. Rome wasn’t built in a day and the same can be said for re-building a dominant editing application from the ground up. Rather than simply put in the same features as the competition, Apple opted to take a fresh look, which has created much “Sturm und Drang” in the industry. Nevertheless, Apple was interested in pointing out the adoption by professional users and the fact that it has held an above-50% market share with new NLE seats sold to professional users during 2011. You can parse those numbers anyway you like, but they point to two facts: a) people aren’t changing systems as quickly as many vocal forum posts imply, and b) many users are buying FCP X and seeing if and how it might work in some or all of their operation. FCP X has already enjoyed several quick updates in less than a year, thanks to the App Store mechanism. There’s a robust third-party developer community building around X. 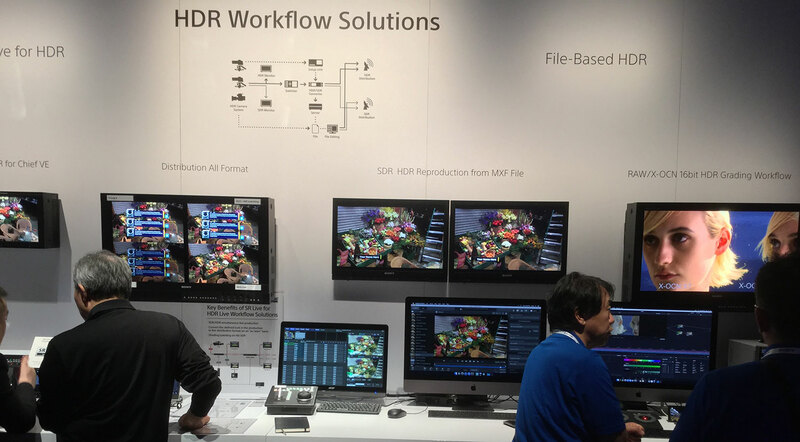 In fact, walking around the NAB floor, I saw at least a dozen or more booths that displayed FCP X in some fashion to demonstrate their own product or use it as an example of interoperability between their product and X. Off the top of my head, I saw or heard about FCP X at Autodesk, Quantel, AJA, Blackmagic Design, Matrox, MOTU, Tools On Air, Dashwood and SONY – not to mention others, like resellers and storage vendors. SONY has announced the new XDCAM plug-ins for X and compatibility of its XDCAM Browser software. Dashwood Cinema Solutions was showing the only stereo3D package that’s ready for Final Cut Pro X. And of course, we can’t live without EDLs, so developer XMiL Workflow Tools (who wasn’t exhibiting at NAB) has also announced EDL-X, an FCP XML-to-EDL translator, expected to be in the App Store by May. On the Apple front, the biggest news was another peek behind the curtain at some of the features to be included in the next FCP X update, coming later this year. These include multichannel audio editing tools, dual viewers, MXF plug-in support and RED camera support. There are no details beyond these bullet points, but you can expect a lot of other minor enhancements as part of this update. “Dual viewers” may be thought of as “source/record” monitors – added by Apple, thanks to user feedback. Apple was careful to point out to me that they intended to do a bit more than just that with the concept. “RED support” also wasn’t defined, but my guess would be that it’s based on the current Import From Camera routine. I would imagine something like FCP 7’s native support of RED media through Log and Transfer, except better options for bringing in camera raw color metadata. Of course, that’s purely speculation on my part. Now, sit back and we’ll run through some “first looks”. Adobe charged into 2012 with a tailwind of two solid years of growth on the Mac platform and heavy customer anticipation for what it plans to offer in Creative Suite 6. The release of CS5 and CS5.5 were each strong in their own right and introduced such technologies as the Mercury Playback Engine for better real-time performance, but in 2011 Adobe clearly ramped up its focus on video professionals. They acquired the IRIDAS SpeedGrade technology and brought the developers of Automatic Duck on board. 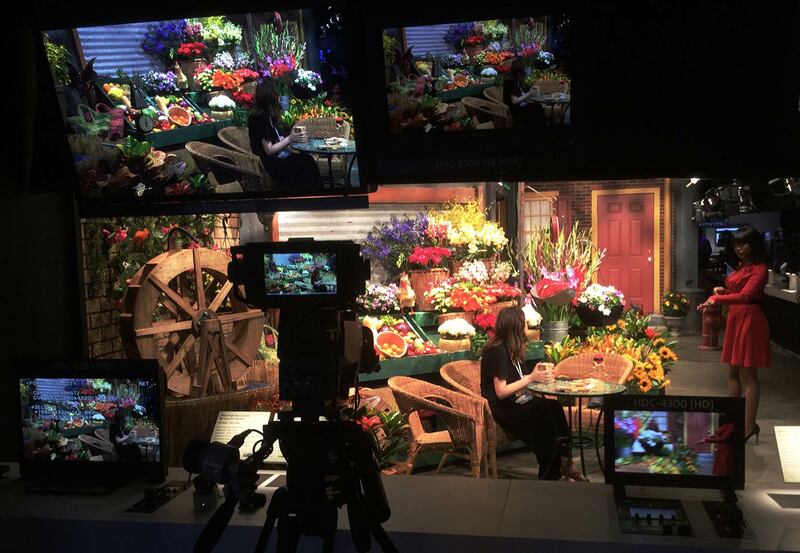 There have been a few sneak peeks on the web including a popular video posted by Conan O’Brien’s Team Coco editors, but the wait for CS6 ended with this year’s NAB. Adobe’s video content creation tools may be purchased individually, through a Creative Cloud subscription or as part of the Master Collection and Production Premium bundles. Most editors will be interested in CS6 Production Premium, which includes Prelude, Premiere Pro, After Effects, Photoshop Extended, SpeedGrade, Audition, Encore, Adobe Media Encoder, Illustrator, Bridge and Flash Professional. Each of these applications has received an impressive list of new features and it would be impossible to touch on every one here, so look for a more in-depth review at a future date. I’ll quickly cover some of the highlights. As part of CS6, Adobe is introducing Prelude, a brand new product designed for footage acquisition, ingest/transcode, organization, review and metadata tagging. It’s intended to be used by production assistants or producers as an application to prepare the footage for an editor. Both Prelude and Premiere Pro now feature “hover scrubbing”, which is the ability to scan through footage quickly by moving the mouse over the clip thumbnail, which can be expanded as large as a mini-viewer. Clips can be marked, metadata added and rough cuts assembled, which in turn are sent to Premiere Pro. There is a dynamic reading of metadata between Prelude and Premiere Pro. Clip metadata changes made in one application are updated in the other, since the information is embedded into the clip itself. Although Prelude is included with the software collection for single users, it can be separately purchased in volume by enterprise customers, such as broadcasters and news organizations. A lot of effort was put into the redesign of Premiere Pro. The user interface has been streamlined and commands and icons were adjusted to be more consistent with both Apple Final Cut Pro (“legacy” versions) and Avid Media Composer. Adobe took input from users who have come from both backgrounds and wanted to alter the UI in a way that was reasonably familiar. The new CS6 keyboard shortcuts borrow from each, but there are also full FCP and full MC preset options. Workspaces have been redesigned, but an editor can still call up CS5.5 workspace layouts with existing projects to ease the transition. 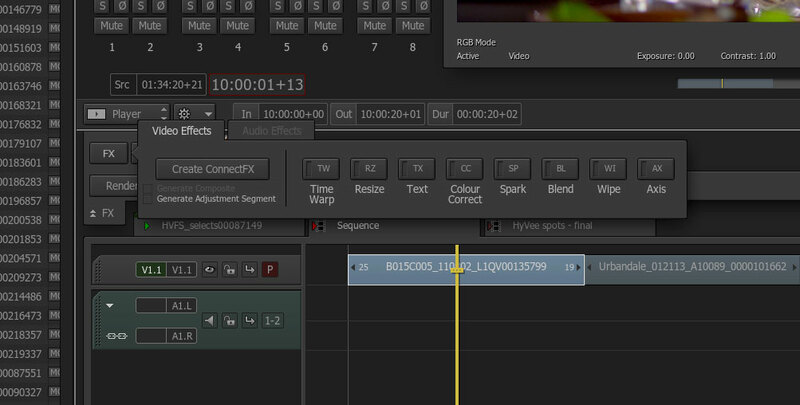 A dockable timecode window has been added and Adobe has integrated a dynamic trimming function similar to that of Media Composer. The changes are definitely more than cosmetic, though, as Adobe has set out to design a UI that never forces you to stop. This means you can now do live updates to effects and even open other applications without the timeline playback ever stopping. They added Mercury Playback acceleration support for some OpenCL cards and there’s a new Mercury Transmit feature for better third-party hardware i/o support across all of the video applications. Many new tools have been added, including a new multi-camera editor with an unlimited number of camera angles. Some more features have been brought over from After Effects, including adjustment layers and the Warp Stabilizer that was introduced with CS5.5. This year they’ve broken out the rolling shutter repair function as a separate tool. Use it for quick HDSLR camera correction without the need to engage the full Warp Stabilizer. 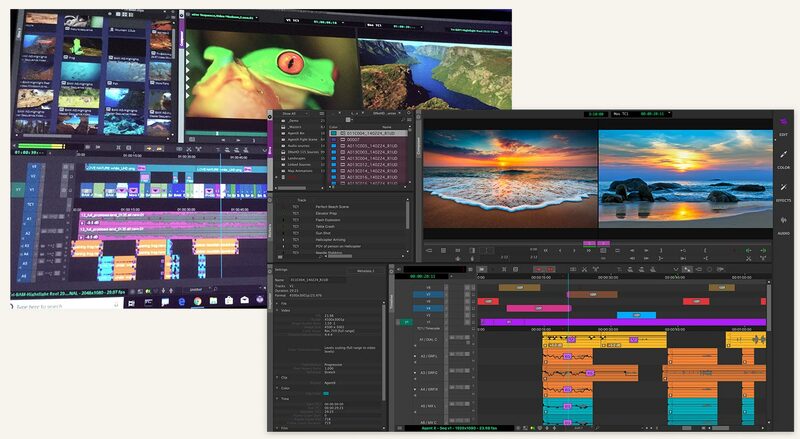 By adding a highly-regarded and established color grading tool, Adobe has strengthened the position of Production Premium as the primary application suite for video professionals. The current level of integration is a starting point, given the short development time that was possible since last September. Expect this to expand in future versions. SpeedGrade works as both a standalone grading application, as well as a companion to the other applications. There’s a new “Send to SpeedGrade” timeline export operation in Premiere Pro. When you go into SpeedGrade this way, an intermediate set of uncompressed DPX files is first rendered as the source media to be used by SpeedGrade. Both applications support a wide range of native formats, but they aren’t all the same, so this approach offers the fewest issues for now, when working with mixed formats in a Premiere sequence. In addition, SpeedGrade can also import EDLs and relink media, which offers a second path from Premiere Pro into SpeedGrade. Finished, rendered media returns to Premiere as a single, flattened file with baked-in corrections. As a color correction tool, SpeedGrade presents an easy workflow – enabling you to stack layers of grading onto a single clip, as well as across the entire timeline. There are dozens of included LUTs and looks presets, which may be used for creative grading or to correct various camera profiles. An added bonus is that both After Effects and Photoshop now support SpeedGrade Look files. With CS5.5, Adobe traded out Soundbooth for a cross-platform version of Audition, Adobe’s full-featured DAW software. In CS6, that integration has been greatly improved. Audition now sports an interface more consistent with After Effects and Premiere, newly added Mackie and Avid Eucon control surface protocol support and mixing automation. The biggest feature demoed in the sneak peeks has been the new Automatic Speech Alignment tool. You can take overdubbed ADR lines and automatically align them for near-perfect sync to replace the on-camera dialogue. All of this is thanks to the technology behind Audition’s new real-time, high-quality audio stretching engine. Audition also gains a number of functions specific to audio professionals. Audio CD mastering has been added back into the program and there’s a new pitch control spectral display. This can be used to alter the pitch of a singer, as well as a new way to create custom sound design. Buying Production Premium gives you access to 20GB of downloadable audio media (sound effects and music scores) formerly available only via the online link to Adobe’s Resource Central. Needless to say, After Effects is the Swiss Army knife of video post. From motion graphics to visual effects to simple format conversation, there’s very little that After Effects isn’t called upon to do. Naturally there’s plenty new in CS6. The buzz feature is a new 3D camera tracker, which uses a point cloud to tightly track an object that exhibits size, position, rotation and perspective changes. These are often very hard for traditional 2D point trackers to follow. For example, the hood of a car moving towards the camera at an angle. Now for the first time in After Effects, you can build extruded 3D text and vector shapes using built-in tools. This includes surface material options and a full 3D ray tracer. In general, performance has been greatly improved through a better hand-off between RAM cache and disk cache. As with Premiere Pro, rolling shutter repair is now also available as a separate tool in After Effects. 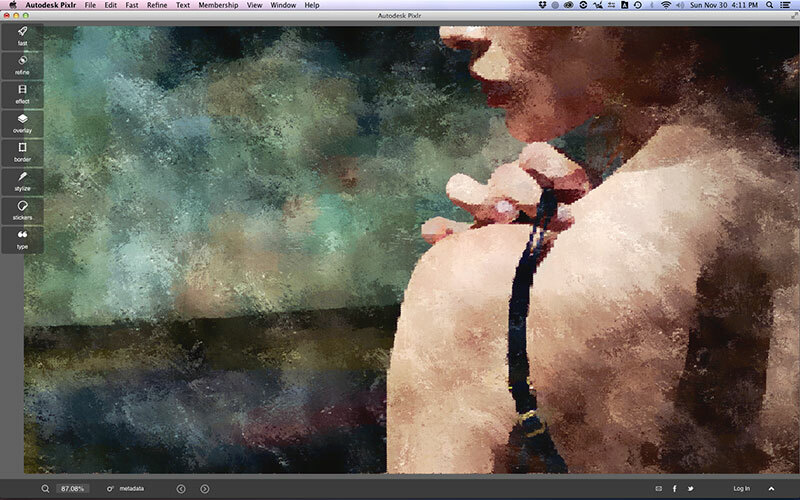 Photoshop has probably had the most online sneak peeks of any of the new Adobe apps. It has been available as a public beta since mid-March. Photoshop, too, sports a new interface, but that’s probably the least noteworthy of the new features. These include impressive new content-aware fill functions, 3D LUT support (including SpeedGrade Look files) and better auto-correction. There’s better use of GPU horsepower, which means common tasks like Liquefy are accelerated. Photoshop has offered the ability to work with video as a single file for several versions. 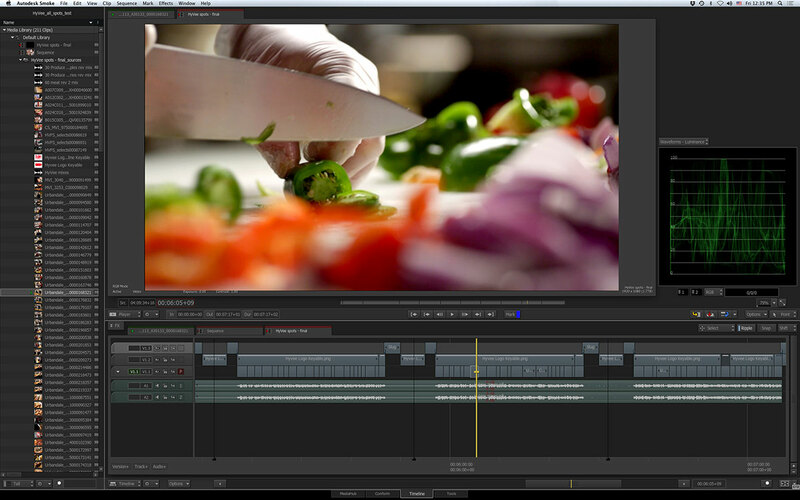 With CS6 it gains expanded video editing capabilities, enabled by a new layer structure akin to that used in After Effects. Although Premiere Pro or After Effects users probably won’t do much with it, Adobe is quite cognizant that many of its photography customers are increasingly asked to deal with video – thanks, of course, to the HD-video-enabled DSLRs, like the Canon EOS series. By integrating video editing and layering tools into Photoshop, it allows these customers to deliver a basic video project while working inside an application environment where they are the most comfortable. Video editors gain the benefit of having it there if they want to use it. Some may, in fact, develop their own innovative techniques once they investigate what it can do for them. Adobe Creative Suite 6 offers a wealth of new features, expanded technologies and a set of brand new tools. It’s one of Adobe’s largest releases ever and promises to attract new interest from video professionals. Click here for updated price and availability information. Click here for videos that explain CS6 features. Plus, a nice set of tutorial videos here. Thanks to the common Unix underpinnings of Linux and Mac OS X, Autodesk Media & Entertainment was able to bring its advanced Smoke editor to the Mac platform in December of 2009 as an unbundled software product. The $15K price tag was a huge drop from that of their standard, turnkey Linux Smoke workstations, but still hefty for the casual user. Nevertheless, thanks to an aggressive trial and academic policy, Autodesk was very successful in getting plenty of potential new users to download and test the product. In the time since the launch on the Mac, Autodesk has had a chance to learn what Mac-oriented editors want and adjust to the feedback from these early adopters. 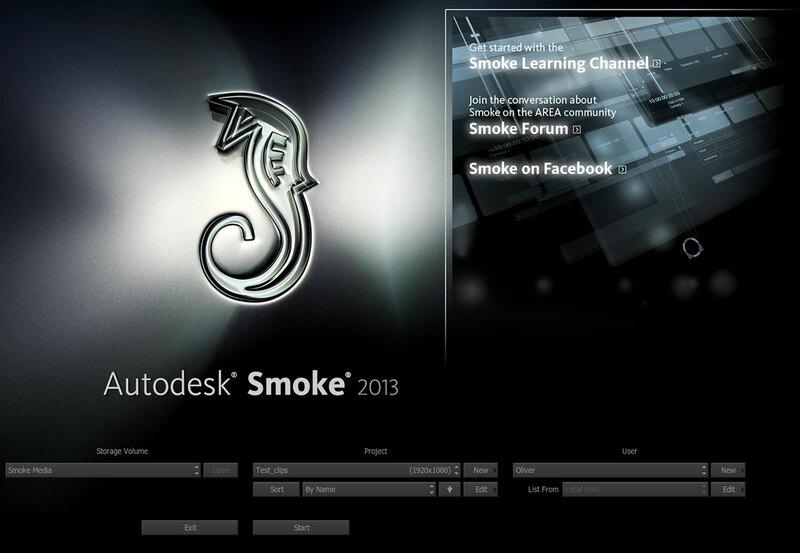 Taking that user input to heart, Autodesk introduced the new Smoke 2013 at NAB. This is an improved version that is much more “Mac-like”. Best of all it’s now available for $3,495 plus an optional annual subscription fee for support and software updates. Although this is an even bigger price reduction, it places Smoke in line with Autodesk’s animation product family (Maya, Softimage, etc.) and in keeping with what most Mac users feel is reasonable for a premium post production tool. Smoke 2013 will ship in fall, but the new price took effect at NAB. Any new and existing customers on subscription will receive the update as part of their support. Tutorials and trial versions of Smoke 2013 are expected to be available over the summer. Autodesk was successful in attracting a lot of trial downloads, but realized that the biggest hurdle was the steep learning curve even expert Final Cut and Media Composer editors encountered. Previous Mac versions of Smoke featured a user interface and commands inherited from the Linux versions of Smoke and Flame, which were completely different from any Mac editing application. Just getting media into the system baffled many. With Smoke 2013, Autodesk has specifically targeted editors who come from an Apple Final Cut Pro and/or Avid Media Composer background. The interface uses a standard, track-based editing workflow to maintain the NLE environment that editors are comfortable with. There’s a familiar Mac OS X menu bar at the top and the application has adopted most of the common OS commands. In short, it’s been redesigned – but not “re-imagined” – to act like a Mac application is supposed to. Smoke now features a tab structure to quickly switch between modes, like media access, editing, etc. The biggest new tool is the Media Hub. This is an intelligent media browser that lets you easily access any compatible media on any of your hard drives. It recognizes native media formats, as opposed to simply browsing all files in the Finder. Media support includes RED, ARRIRAW, ProRes, DNxHD, H.264, XDCAM, image sequences, LUTs and more. Media Hub is the place to locate and import files, including the ability to drag-and-drop media directly into your Smoke library, as well as from the Finder into Smoke. Settings for formats like RED (debayer, color, etc.) are maintained even when you drag from the Finder. 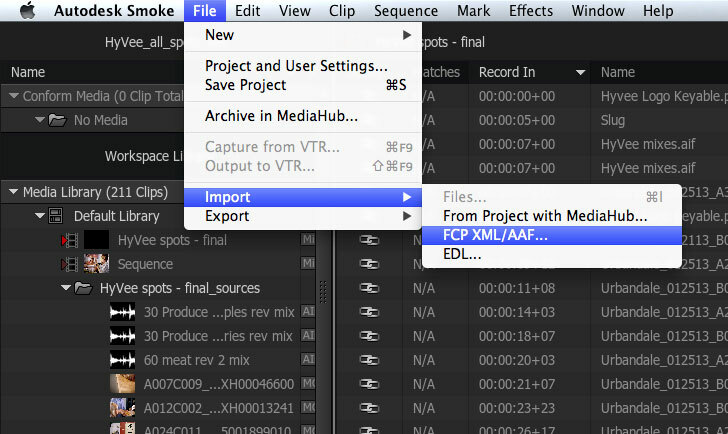 Since Smoke is designed as a finishing tool, you can also import AAF, XML (FCP 7, FCP X, Premiere Pro) and EDL lists generated by offline editors. Beyond familiar commands and the Media Hub, the editing interface has been redesigned to be more visually appealing and for the easier application of effects. ConnectFX is a method to quickly apply and modify effects right in the timeline. Tabbed buttons let you change between modes, such as resizing, time warps, Sparks filter effects and color correction. When you choose to edit effects parameters, the interface opens a ribbon above the timeline where you can alter numerical settings or enter a more advanced effects editing interface. If you need more sophistication, then move to nodes using ConnectFX. Smoke is the only editor with a node-based compositor that works in 3D space. You get many of the tools that have been the hallmark of the premium Autodesk system products, such as effects process nodes, the Colour Warper, relighting, 3D tracking and more. Smoke 2013 is positioned as an integrated editing and effects tool. According to Autodesk’s research, editors who use a mixture of several different tools to get the job done – from editing to effects to grading – often use up to seven different software applications. Smoke is intended as a “super editor” that places all of these tools and tasks into a single, comprehensive application with a cohesive interface. The design is intended to maximize the workflow as an editor moves from editing into finishing. Apple is changing the technology landscape with more powerful personal workstations, like the iMac, which doesn’t fit the traditional tower design. Thunderbolt adds advanced, high-bandwidth connectivity for i/o and storage in a single cable connection. To take advantage of these changes, Smoke 2013 has been designed to run on this new breed of system. For example, it will work on a newer MacBook Pro or iMac, connected to fast Thunderbolt storage, like a Promise Pegasus RAID array. A key change has been in the render format used by Smoke. 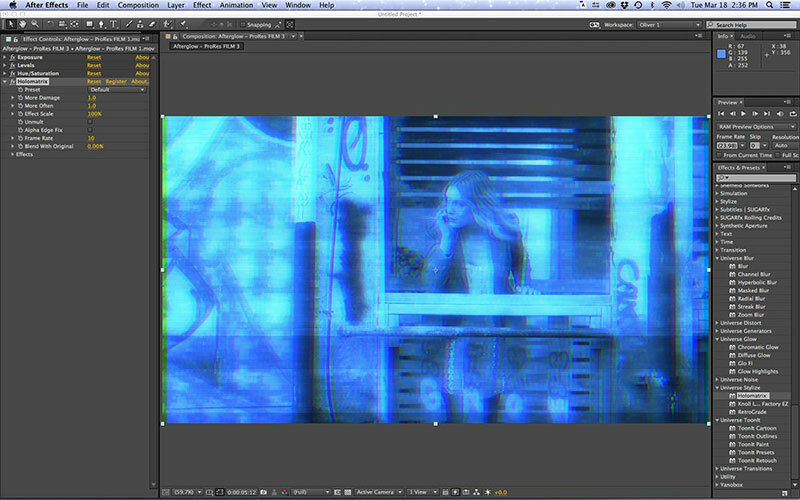 Up until now, intermediate renders have been to uncompressed RGB 4:4:4 DPX image sequence files. While this maintains maximum quality, it quickly eats storage space and is taxing on less powerful machines. Rendering to an uncompressed RGB format is generally overkill if your camera originals started as some highly-compressed format like XDCAM or H.264. Now Smoke 2013 offers the option to render to compressed formats, such as one of the Apple ProRes codecs. Another welcomed change is the ability to use some of the newer Thunderbolt i/o devices. Smoke on a Mac Pro tower has been able to work with AJA KONA 3G cards, but with Smoke 2013, AJA’s new Io XT has been added to the mix. The Io XT is an external unit with most of the features and power of the KONA card. It connects in the Thunderbolt chain with storage and/or a secondary display and is the only current Thunderbolt i/o device with a loop-through connection. Thus it isn’t limited to being at the end of the chain. While at NAB, I took a few minutes to see how comfortable this new version felt. I’ve been testing Smoke 2012 at home and quite frankly had some of the same issues other FCP and Media Composer editors have had. It has been a very deep program that required a lot of relearning before you could feel comfortable. When I sat down in front of Smoke 2013 in the NAB pod, I was able to quickly work through some effects without any assistance, primarily based on what seemed logical to me in a “standard” NLE approach. I’m not going to kid you, though. To do advanced effects still requires a learning curve, but editors do plenty of in-timeline effects that never require extensive compositing. When I compare doing this type of work in Smoke 2013 versus 2012, I’d say that the learning requirements have been cut by 60% to 75% with this new version. That’s how much the redesign improves things for beginners. You can start from scratch editing a project strictly on Smoke 2013, but in case you are wondering, this really shouldn’t be viewed as a complete replacement for FCP 7. Instead, it’s the advanced product used to add the polish. As such, it becomes an ideal companion for a fast application used for creative cutting, like Final Cut Pro, Premiere Pro or Media Composer. Apple’s launch of Final Cut Pro X was a disruptive event that challenged conventional thinking. 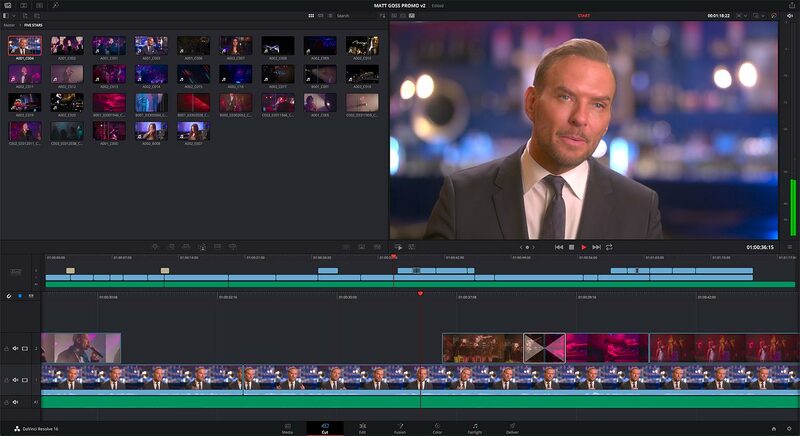 Autodesk Media & Entertainment’s launch of Smoke 2013 might not cause the same sort of uproar, but it brings a world-class finishing application to the Mac at a price that is attractive to many individual users and small boutiques. Click here for videos and tutorials about Smoke. Click here for Autodesk’s NAB videos. Over the years media pros have seen data protocols come and go. Some, like Fibre Channel, are still current fixtures, while others, such as SCSI, have bitten the dust. The most exciting new technology is Thunderbolt, which is a merger of PCI Express and DisplayPort technologies co-developed by Intel and Apple. Started under the code name of Light Peak, the current implementation of Thunderbolt is a bi-directional protocol that passes power, video display signals and data transfer at up to 10Gbps of throughput in both directions. According to Apple, that’s up to twelve times faster than FireWire 800. It’s also faster than Fibre Channel, which tends to be the protocol of choice in larger facilities. Peripherals can access ten watts of power through Thunderbolt, too. Like SCSI and FireWire, Thunderbolt devices can be daisy-chained with special cables. Up to six devices can be connected in series, but certain devices have to be at the end of the chain. This is typically true when a PCIe-to-Thunderbolt adapter is used. A single signal path can connect the computer to external storage, displays and capture devices, which provides editors with a powerful data protocol in a very small footprint. Thunderbolt technology is currently available in Apple iMac, MacBook Air, MacBook Pro and Mini computers and is starting to become available on some Windows systems. It is not currently available as a built-in technology on Mac Pros, but you can bet that if there’s a replacement tower, Thunderbolt will be a key part of the engineering design. By its nature, Thunderbolt dictates that peripheral devices are external units. All of the processing horsepower of a PCIe card, such as a KONA or Decklink, is built into the circuitry of an external device, which is connected via the Thunderbolt cable to the host computer. I tested three Thunderbolt capture/output devices for this review: AJA Io XT, Blackmagic Design UltraStudio 3D and Matrox MXO2 LE MAX. AJA added the monitoring-only T-Tap at NAB to join the Io XT in AJA’s Thunderbolt line-up. Blackmagic Design has developed four Thunderbolt units at difference price tiers. For smaller installations or mobile environments, the UltraStudio Express, Intensity Shuttle Thunderbolt or Intensity Extreme are viable solutions. Matrox has taken a different approach by using an adapter. Any of its four MXO2 products – the standard MXO2, Mini, LE or Rack – can be used with either Thunderbolt or non-Thunderbolt workstations. Simply purchase the unit with a Thunderbolt adapter, PCIe card and/or Express 34 slot laptop card. The MXO2 product is the same and only the connection method differs for maximum flexibility. The fourth company making Thunderbolt capture devices is MOTU. Their HDX-SDI was not available in time for this review, but I did have a chance to play with one briefly on the NAB show floor. All three of the tested units include up/down/cross-conversion between SD and HD formats and perform in the same fashion as their non-Thunderbolt siblings. Each has pros and cons that will appeal to various users with differing needs. For instance, the AJA Io XT is the only device with a Thunderbolt pass-through connector. The other units have to be placed at the end of a Thunderbolt path. They all support SDI and HDMI capture and output, as well as RS-422 VTR control. Both the AJA and Blackmagic units support dual-link SDI for RGB 4:4:4 image capture and output. The Matrox and AJA units use a power supply connected via a four-pin XLR, which makes it possible to operate them in the field on battery power. The need to work with legacy analog formats or monitoring could determine your choice. This capability represents the biggest practical difference among the three. Both the MXO2 LE and UltraStudio 3D support analog capture and output, while there’s only analog output from the Io XT. The MXO2 LE uses standard BNC and XLR analog connectors (two audio channels on the LE, but more with the MXO2 or Rack), but the other two require a cable harness with a myriad of small connectors. That harness is included with the Blackmagic unit, but with AJA, you need to purchase an optional DB-25 Tascam-style cable snake for up to eight channels of balanced analog audio. One unique benefit of the Matrox products is the optional MAX chip for accelerated H.264 processing. In my case, I tested the MXO2 LE MAX, which includes the embedded chip. When this unit is connected to a Mac computer, Apple Compressor, Adobe Media Encoder, Avid Media Composer, Telestream Episode and QuickTime perform hardware-accelerated encodes of H.264 files using the Matrox presets. I ran the Io XT, UltraStudio 3D and MXO2 LE through their paces connected to a friend’s new, top-of-the-line Apple iMac. All three deliver uncompressed SD or HD video over the Thunderbolt cable to the workstation. Processing to convert this signal to an encoded ProRes or DNxHD format will depend on the CPU. In short, recording a codec like ProRes4444 will require a fast machine and drives. I haven’t specifically tested it, but I presume this task would definitely challenge a Mac Mini using only internal drives! The test-bed iMac workstation was configured with a Promise Pegasus 6-drive RAID array. The iMac includes two Thunderbolt ports and the Pegasus array offers a pass-through, so I was able to test these units both directly connected to the iMac, as well as daisy-chained onto the Promise array. This system would still allow the connection of more Thunderbolt storage and/or a secondary computer monitor, such as Apple’s 27″ Thunderbolt Display. Most peripheral manufacturers do not automatically supply cables, so plan on purchasing extra Thunderbolt cables ($49 for a six-foot cable from Apple). These units work with most of the current crop of Mac OS X-based NLEs; however, you may need to choose a specific driver or software set to match the NLE you plan to operate. For instance, AJA requires a separate additional driver to be installed for Premiere Pro or Media Composer, which is provided for maximum functionality with those applications. The same is true for Matrox and Media Composer. I ran tests with Final Cut Pro 7, X and Premiere Pro CS 5.5, but not Media Composer 6, although they do work fine with that application. 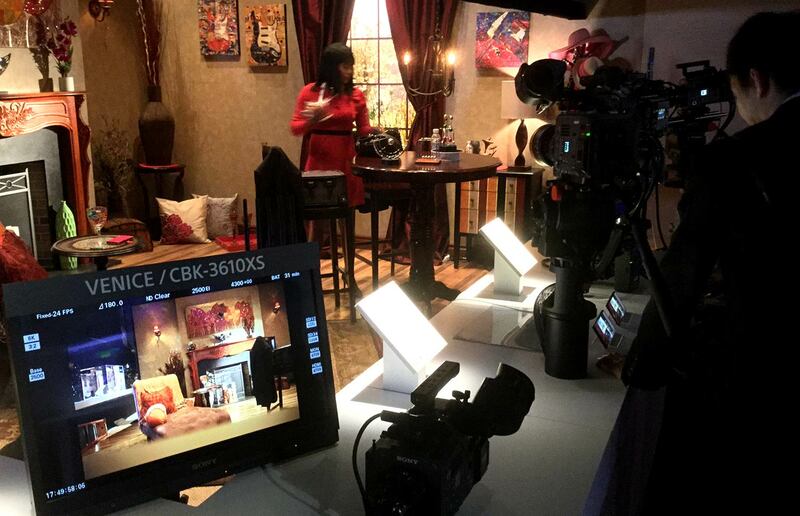 Only the Blackmagic Design products, like the UltraStudio 3D, will work with DaVinci Resolve. In addition to drivers, the software installation includes application presets and utility applications. Each build includes a capture/output application, which lets you ingest and lay off files through the device, independent of any editing application. The biggest wild card right now is performance with Final Cut Pro X. Broadcast monitoring was a beta feature added in the 10.0.3 update. With the release of 10.0.4 and compatible drivers, most performance issues have stabilized and this is no longer considered beta. Separate FCP X-specific drivers may need to be installed depending on the device. If you intend to work mainly with Final Cut Pro “legacy” or Premiere Pro, then all of these units work well. 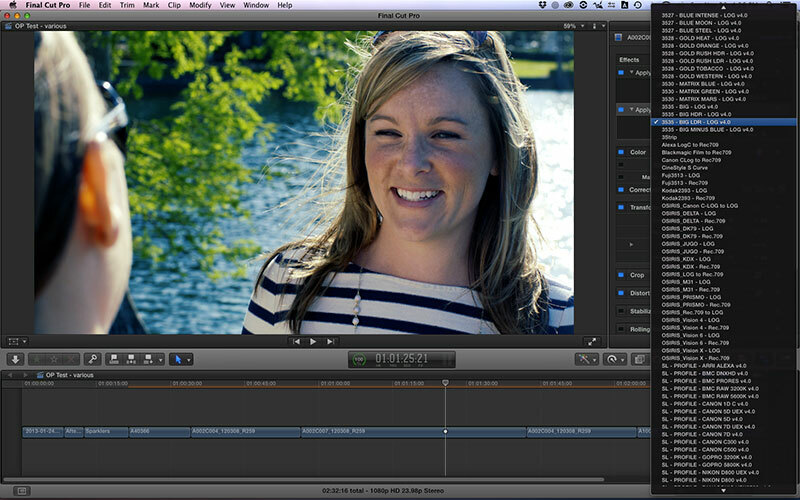 On the other hand, if you’ve taken the plunge for FCP X, I would recommend the Io XT. I never got the MXO2 LE MAX to work with FCP X (10.0.3) during the testing period and initially the UltraStudio 3D wouldn’t work either, until the later version 9.2 drivers that Blackmagic posted mid-March. Subsequent re-testing with 10.0.4 and checking these units at NAB, indicate that both the Blackmagic and Matrox units work well enough. There are still some issues when you play at fast-forward speeds, where the viewer and external monitor don’t stay in sync with each other. I also checked the MOTU HDX-SDI device with FCP X in their NAB booth. Performance seemed similar to that of Matrox and Blackmagic Design. The Io XT was very fluid and tracked FCP X quite well as I skimmed through footage. FCP X does not permit control over playback settings, so you have to set that in the control panel application (AJA) or system preference pane (Blackmagic Design and Matrox) and relaunch FCP X after any change. The broadcast monitoring feature in FCP X does not add any new VTR control or ingest capability and it’s unlikely that it ever will. To ingest videotape footage for FCP X using Io XT or UltraStudio, you will have to use the separate installed capture utility (VTR Xchange or Media Express, respectively) and then import those files from the hard drive into FCP X. Going the other direction requires that you export a self-contained movie file and use the same utility to record that file onto tape. The Matrox FCP X drivers and software currently do not include this feature. Finally, the image to the Panasonic professional monitor I was using in this bay matched the FCP X viewer image on the iMac screen using either the Io XT or UltraStudio 3D. That attests to Apple’s accuracy claims for its ColorSync technology. Ironically the best overall performance was using the end-of-life Final Cut Pro 7. In fact, all three units were incredibly responsive on this iMac/Promise combo. For example, when you use a Mac Pro with any FireWire or PCIe-connected card or device, energetic scrubbing or playing files at fast-forward speeds will result in the screen display and the external output going quickly out of sync with each other. When I performed the same functions on the iMac, the on-screen and external output stayed in sync with each of these three units. No amount of violent scrubbing caused it to lose sync. The faster data throughput and Thunderbolt technology had enabled a more pleasant editing experience. I ran these tests using both a direct run from the iMac’s second Thunderbolt port, as well as looped from the back of the Promise array. Neither connection seemed to make much difference in performance with ProRes and AVCHD footage. I believe that you get the most data throughput when you are not daisy-chaining devices, however, I doubt you’ll see much difference under standard editing operation. The best experience with Premiere Pro was using the Matrox MXO2 LE MAX, although the experience with the AJA and Blackmagic Design devices was fine, too. This stands to reason, as Matrox has historically had a strong track record developing for Adobe systems with custom cards, such as the Axio board set. Matrox also installs a high-quality MPEG-2 I-frame codec for use as an intermediate preview codec. This is an alternative to the QuickTime codecs installed on the system. Portions of this entry originally written for Digital Video Magazine.